The final stop on my recent trip to the hilterlands (a Molly Ivins reference...we could sure use her humor this political season) of eastern Washington was Ice Harbor Brewing in Kennewick. I had hoped to also visit White Bluffs Brewing in nearby Richland, but the timing of my trip and their limited hours put the kibosh on that plan. Next time, hopefully. I've recently seen some snarky comments in reference to the breweries and beers of the inland Northwest. These were Facebook comments made by self-anointed craft beer experts. These experts have a limited knowledge of beer and the beer business and a low opinion of rural sod busters who apparently ought to be making moonshine, not beer. I'm tempted to go off on a rant about the many rural-based breweries that produce great beer, but that's probably best left for another day. 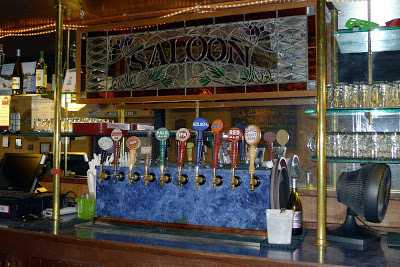 I'll leave it at this: A brewery does not have to reside in the state of Multnomah in order for it to produce good beer. Brewing systems may be smaller and less sophisticated in the hilterlands, but there are many good beers there...even if they aren't always poured in the fanciest, trendiest, hippest (think hipster) joints. Good beer has no shame, wherever it lives. 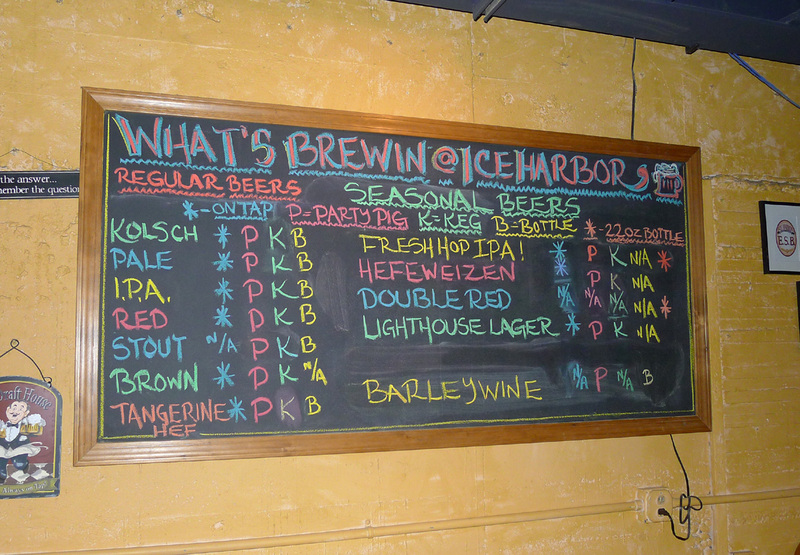 Ice Harbor Brewing is not a new kid on the block. 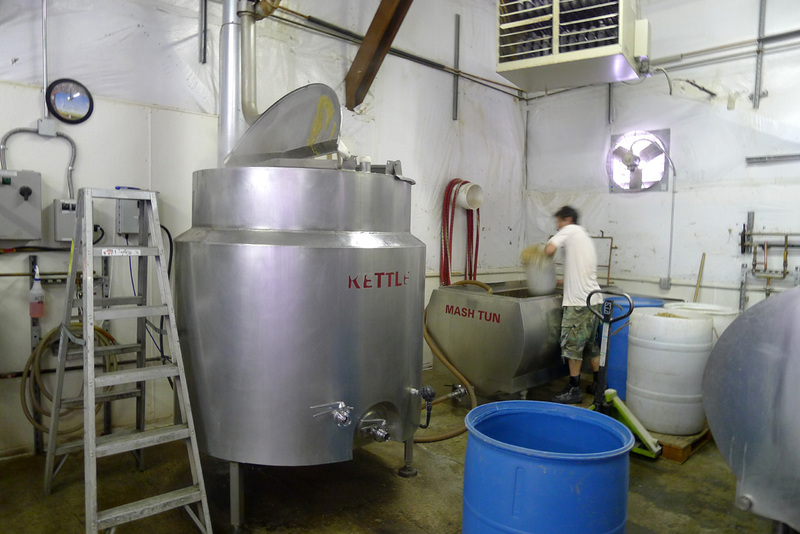 The brewery was established in 1996 in a building on Benton Street that was formerly a grain mill. 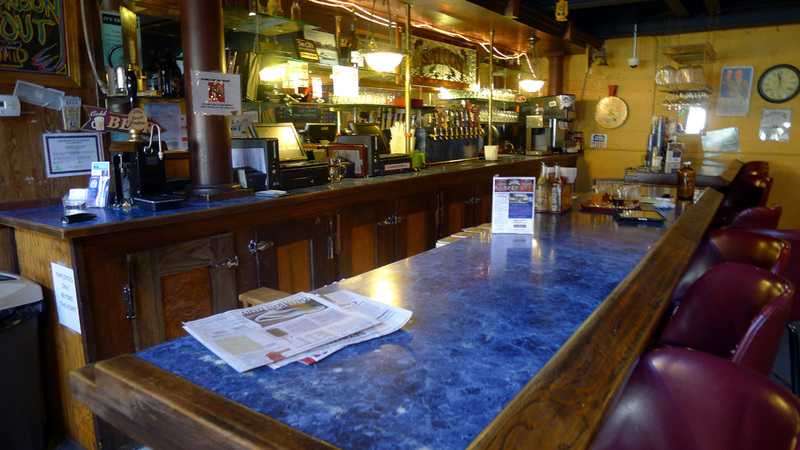 In recent years, they opened a marina location on Clover Island on the Columbia River. All of the brewing is done at the Benton St. location, which is also a brewpub and homebrewing supply store. The 10 bbl brewing system at Ice Harbor is old school, fabricated from recycled dairy equipment. Lest you laugh, please recall that a lot of early craft brewers, including Kurt and Rob Widmer, used recycled dairy equipment to get their brands off the ground. What they have at Ice Harbor isn't fancy, but it works just fine, thanks. Supplying their pubs and distribution channels, which I'll get to momentarily, would be nary impossible if not for the four 30 bbl fermenters on the brewery floor. They also have a flat, 1000 gal. 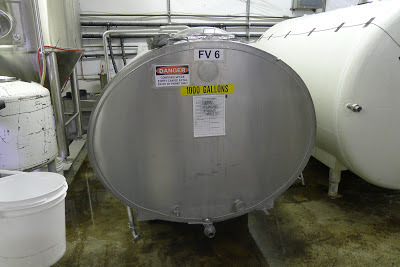 tank used exclusively for dry-hopping...they believe a flat tank improves hop absorption over a conical tank, where hops settle and must be stirred up. Makes sense. Back to distribution...beyond the two locations, Ice Harbor distributes its beer by the keg and bottle primarily in the Tri-Cities area. They were selling 12 and 22 oz bottles at the pub and those can evidently be found in local stores. 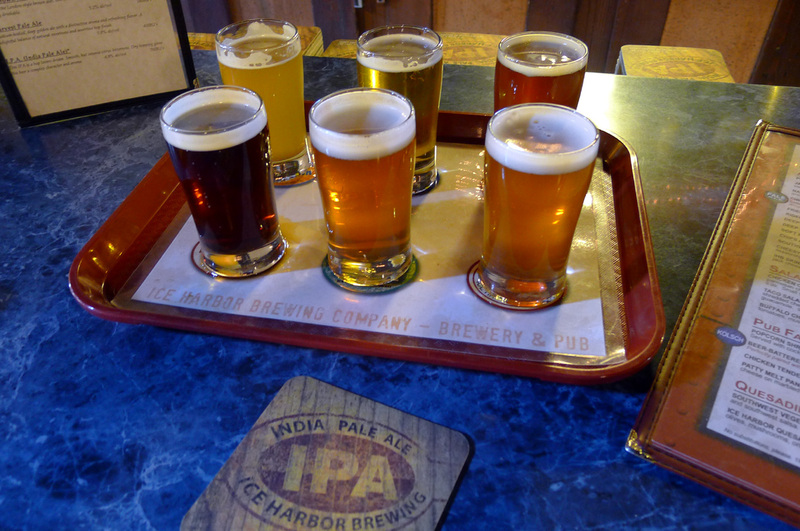 An industry friend says Ice Harbor is looking to have its beer distributed in Portland and possibly Seattle in the near future, which would up the ante, for sure. In a strange twist, Ice Harbor owns a small 12 oz bottling line. I had never seen one before... it looks much like the mobile setup that does 22 oz bottles, except it uses smaller bottles. The problem with the 12 oz system is it is quite inefficient...you spend a lot of time bottling not very much beer. They will likely want to enter the larger urban markets in 22 oz bottles or 16 oz cans, and you suspect they will be using a mobile arrangement to make that happen, at least initially. Brewing capacity won't be a huge issue until extended distribution takes hold. 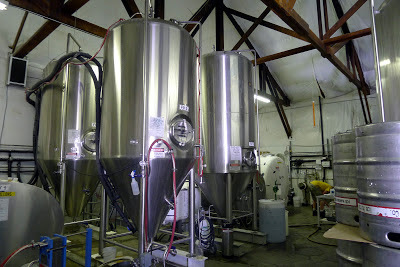 If and when that happens, they will likely want to install a larger brewhouse and maybe a more fermenters. Fortunately, they have a bit of space in this location to update and expand their brewing capacity. This runs contrary to most places I've been to in recent times. There is a wee bit of Back to the Future here. 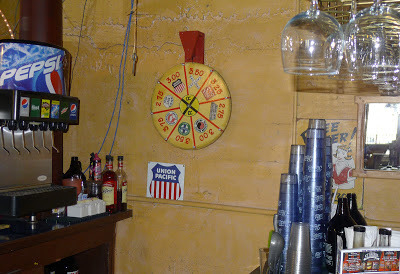 When I walked in and sat down at the bar, 70's classic rock was playing on the sound system. The surroundings are quaint and somewhat dated. It was lunchtime and the place was mostly empty, although folks started shuffling in soon after I arrived. I'm not saying you won't hear old classic rock or find quaint surroundings in Portland; however, this felt a little retro...but not in a bad way. I almost looked around to see if I could spot my dad as a young man. McFly! They were serving up a nice list of beers. I ordered up a tray of tasters that included Tangerine Hefeweizen, Columbia Kolsch, Runaway Red, Nut Brown Ale, Harvest Pale Ale and IPA. The gal at the bar gave me separate, smaller samples of their Fresh Hop IPA and Fresh Hop Double Red. Rural charm. The Tangerine Hef reminded me vaguely of the Peach Hef I'd recently tasted at Laht Neppur. The tangerine version is mildly tart with a hint of something Belgian...I suppose the combination of yeast, wheat and fruit. Not bad, though I must say the Peach Hef from Waitsburg is a bit more refined. The most accomplished beer on the plate was the IPA, which featured a perfect balance of malt backbone and hops. This beer is reminiscent of Boneyard RPM, nicely dry-hopped to maximize piney, pineapple notes in aroma and flavor. Of the beers I tasted, the IPA is the one I would definitely bring to Portland. Of the two fresh hop beers, I much-preferred the Red, which had some interesting hop flavors and aromas without being overbearing. This beer was vaguely similar to Laurelwood's Fresh Hop Red, although the Ice Harbor version has a thinner, less assertive core upon which the fresh hop laminate resides. It occurs to me that I prefer fresh hop reds because they do a better job of concealing earthy, leafy, compost-like fresh hop flavors than a pale or IPA. They were not pouring their imperial IPA, Hop Warrior, when I stopped in. Hop Warrior isn't huge by IIPA standards at just over 8 %, and not much bigger than their standard IPA, which comes in at 6.8%, I bought a bottle of each to take home and eventually got around to tasting them. Hop Warrior is a bigger hop bomb than the standard, but these are both nice beers that could attract interest in urban markets. In my opinion. This is certainly a spot worth checking out if you happen to be on the road between Portland/Seattle and the hilterlands of eastern Washington. 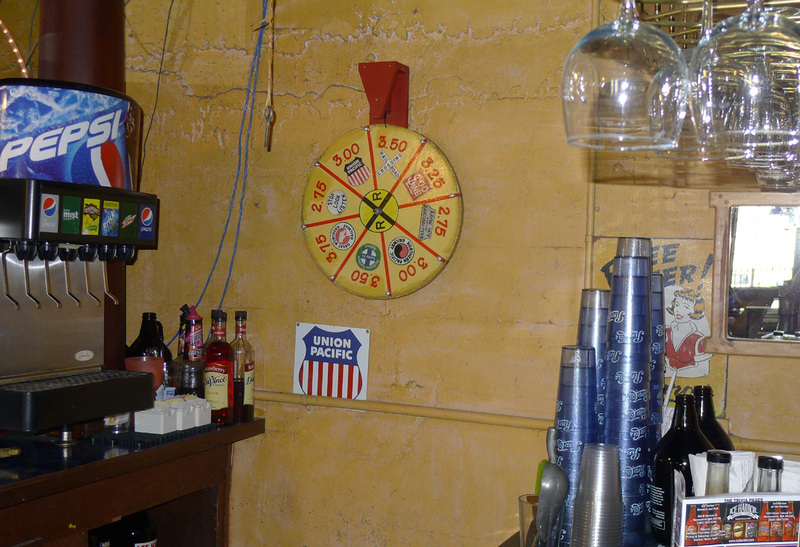 If you do make it in, be sure to listen for a passing train (the tracks are close), which will cause the barkeep to spin the wheel mounted on the wall at one end of the bar. This is an apparent reference to Wheel of Fortune, only in this case where the wheel winds up determines the cost of your next beer. Cool stuff! Special thanks to the folks at Ice Harbor for showing me around and making me feel right at home, in particular brewer Adam Crane. Adam subbed in nicely for Ice Harbor's fearless head of brewing, Russ Corey.